~20 feet, width at base ~9 inches. Surreal seed pods, astronomically large asparagus-like stalks, strangling aphrodisiacs, quirky contrasting textures, determined invaders rooting in the oddest places…. Flora fascinates me. Can I tickle your fancy with a few of these, seen in the Bahamas? Cresting a ridge at Buena Vista, we came across a stalk reaching easily 20 feet up, with a base of at least nine inches. The stalk looked a lot like a gargantuan asparagus -- I felt Lilliputian. Its ample base of long strappy, spike-tipped leaved, radiating out from the stalk, reminded me of the New Zealand flax in my parents Sacramento California backyard. They also remind me a bit of century plants, or the silver sword plants seen atop Maui’s Haleakala volcano rim. Cacti are not that unusual. In the Bahamas, poking out of soft sand, in the same vicinity as coconut palms rather than in a desert, cacti feel out of context. To me, it’s akin to a bride wearing a black leather, spike-studded choker to accessorize her filmy white wedding dress. Large leaves of silvery, velveteen do not seem to belong on the same shrub with bouquets of stiff star-shaped little white with red-violet-tipped flowers that look like they were cut from Styrofoam egg cartons then got a sassy French manicure in reverse. red violet starry flower clusters on Rum Cay. Anything that can sink its woody roots firmly in saline impresses me; especially when it must also survive not only regular tidal flows, but hurricane force wind and waves. 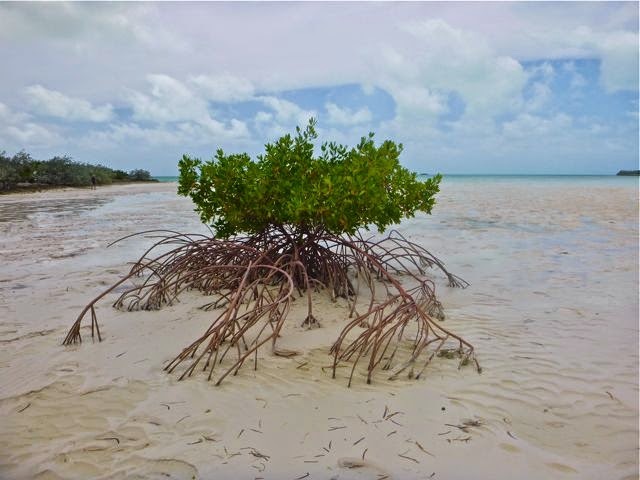 Mangroves not only flourish in that harsh environment, they provide a rich protective forest-like structure for an amazing array of wildlife… from slow moving snails and their larger hard shelled cousins, the conchs, to zipping turtles (yes – amazingly – turtles can be fast!) to breeding grounds for sharks and rays. in the middle of Hog Cay’s tidal flats. 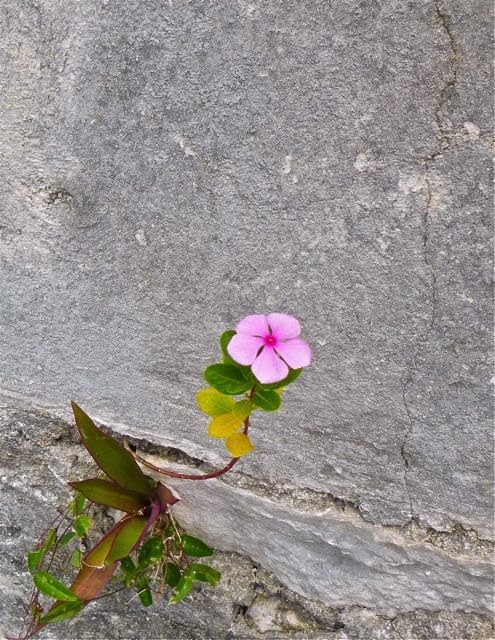 It was oddly amusingly ironic to find Cat Island’s two most famous historic stone churches invaded by “delicate” impatiens flowers and vibrantly hued wandering jew plants. Both were taking root in fine line foundation cracks in both New Bight’s fabulous hilltop Hermitage monastery, and the Anglican church in Old Bight. Tough characters, and, apparently, irreverent. More assertive is the love vine, sprawling its mostly leafless, landscape choking tendrils more profusely than a hairy scalp overdosed on minoxidil. 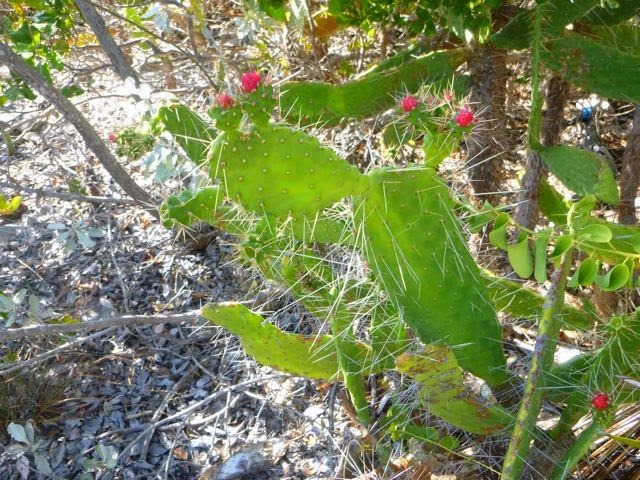 It earned its name by offering its services as an aphrodisiac, according to a Bahamian historian who discussed local folk medicine. From aphrodisiac plants, we move on to the next cycle of (plant) life… seed pods. 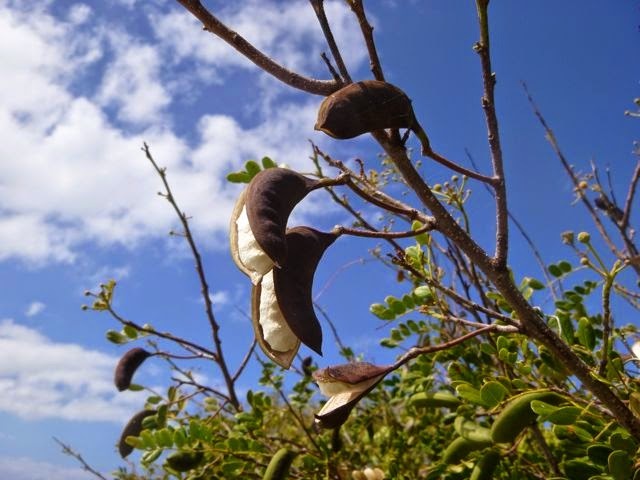 On Stocking Island, the splitting seed pods reminded me of little birds, mouths agape, waiting for momma bird to stuff them with regurgitated nutrition, whilst they build their strength to eventually take wing. 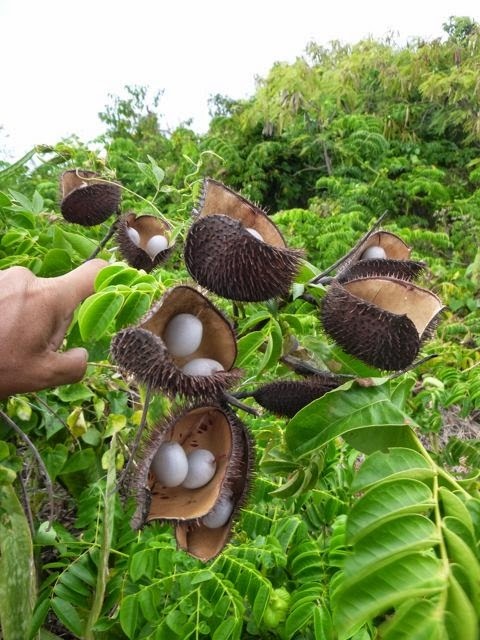 The spiky seed pods on Rum Cay contained innards like little eggs, snugly seated in a nest. Great Guana across from Farmer’s Cay. Feel free as well to fill us in on your favorites -- all the more if so there’s a photo or story to illustrate what it is about them that intrigues you! Oh, and if you liked this post, watch for a future post on the most amazing travelers of the plant kingdom,,, sea beans. 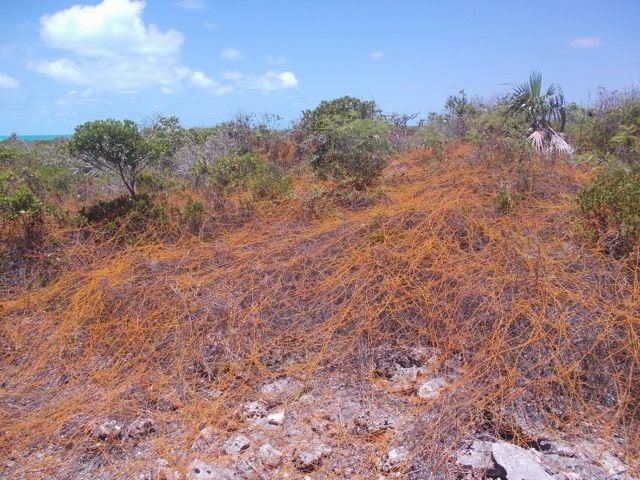 Spiky seed pods, Rum Cay. Wanted! 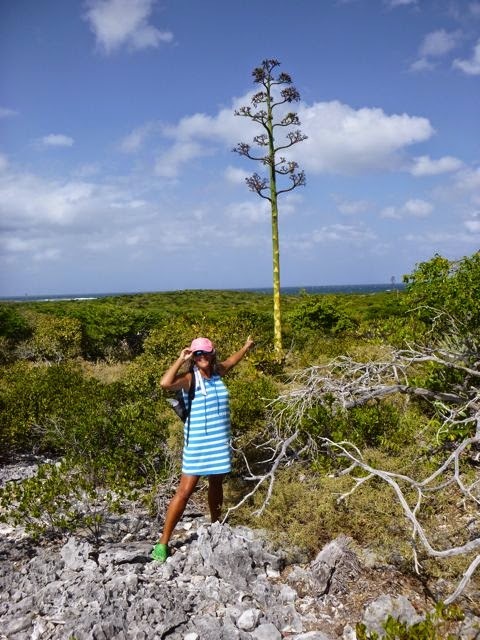 Helpful Bahamian Botany Experts! 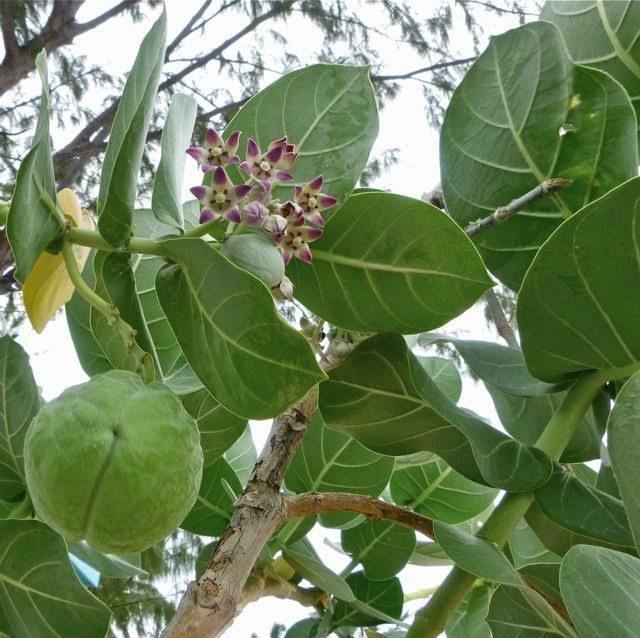 If you can put me in touch with any Bahamian botany experts or are one yourself, any help finding out the common and scientific names and origins of these peculiar plants would be much appreciated! Otherwise, check back in a few months, as I will research this when my internet access is more ample in the United States. Sacramento was kindergarten only then we moved to San Jose.